HBO Films' The Wizard of Lies is now available to view by digital download and will be out on Blu-ray and DVD on October 3, 2017. Starring two time Oscar winner Robert De Niro and three time Oscar nominee Michelle Pfeiffer, this drama dissects the events that led to the Wall Street financier Bernie Maddof's stunning downfall in December 2008 for defrauding investors of over $65 billion in the most infamous Ponzi scheme in U.S. history. The film has received great reviews from critics and has garnered four 2017 Emmy nominations --> Outstanding Casting for a Limited Series, Movie or Special; Outstanding Supporting Actress in a Limited Series or Movie (Pfeiffer); Outstanding Lead Actor in Limited Series or Movie (De Niro); and Outstanding Television Movie. 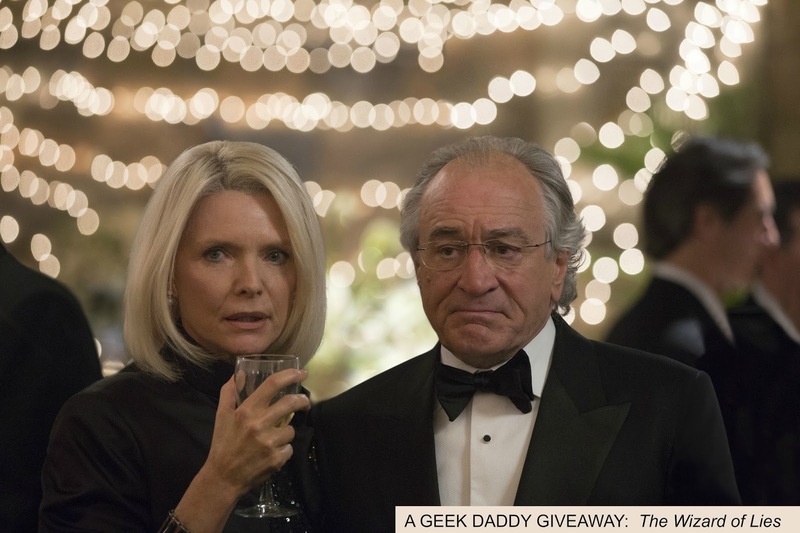 In celebration of its Emmy nominations, HBO Films has provided A Geek Daddy with a digital download code for The Wizard of Lies to giveaway. Just follow @Geekdad248 on Twitter and retweet the message below by 11:59 pm EST on Thursday July 27, 2017 for a chance to win it. One lucky entrant will be randomly selected from all eligible entries. Must be a U.S. resident over 18 years old to participate. The selected winner must respond to their winner notification within 48 hours or a new person will be selected to receive the prize.